(CNN)-Maybe it was wishful thinking. North Carolina Gov. 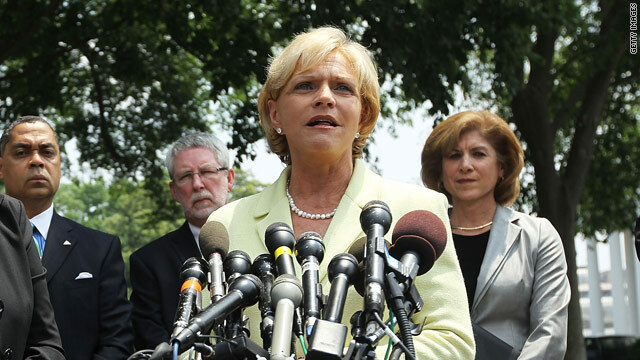 Bev Perdue, whose second term in the governor's mansion is no guarantee, told a group of Rotarians Tuesday that she thinks "we ought to suspend, perhaps, elections for Congress for two years." The Democratic chief executive was elected in 2008 with a three-point advantage over her Republican opponent and is expected to face a tough battle for re-election. But state politics weren't the talk of the hour when she spoke to the Rotary Club, according to the Raleigh News & Observer. Perdue was discussing the economy, which she felt might be important enough to preclude elections…maybe. "You have to have more ability from Congress, I think, to work together and to get over the partisan bickering and focus on fixing things," she said. "I think we ought to suspend, perhaps, elections for Congress for two years and just tell them we won't hold it against them, whatever decisions they make, to just let them help this country recover." And in what the article describes as a "level" tone, she said, "I really hope that someone can agree with me on that." Press Secretary Christine Mackey pushed back at criticism blasting the governor for her seemingly-cavalier remarks in a statement saying, "Come on. Gov. Perdue was obviously using hyperbole to highlight what we can all agree is a serious problem: Washington politicians who focus on their own election instead of what's best for the people they serve." That governor needs to THINK before speaking! The current members of Congress have PROVEN that they cannot get past re-election campaigning to do anything to help our nation - why on earth would anyone want to keep the current bunch of political clowns in office a minute longer than necessary? We need TERM LIMITS on Congress - as soon as they get elected they start spending 90% of their time trying to re-elected - and 9% of their time is spent socializing with only 1% of their time spent doing their job ... and their jobs need at least 95% of their time, so of course their performance is terrible! NEVER RE-ELECT ANYONE!!! Agree to dis -agree not to fast our Mutter taugh us men every thing we know. I love our mutter most all the time political or none political congress take heed they are watching you all. Not sure you can read that as anything but exaggeration in an ill-conceieved attempt to make her point stick better. To be sure, it was poorly executed rhetorical flourish, but nothing more than that. Personally, I think caning the entire Congress and then suspending their pay indefinitely would suffice to wake them up a bit. Then the obvious thing to do is impose term limits to ONE term so there is no re-election distractions while politians are in office. If they want they can run for the next election after they are out of office. Dems always feel we need to "get along", "work together" and "put aside our differences for the good of the country" when there is a Dem president. Where was all this Kumbaya stuff when george Bush was being excoriated by the dems and the media for everything. Remember Harry Reid shutting down the Senate with unprecidented moves to protest Bush policies? This is the way of our unique form of Democracy. Right now we are divided over a huge fundemntal philisophical disagreement over the size and scope of our federal government. The first evidence was the election of 2010 where the country by historical numbers rejected Nancy Pelosi and the dems policies and handed controll of Congress to the reps who ran on controlling spending and riegning in the size and reach of the Govt.. (this fact is seldom brought up by the media) President Obama and his friends in the liberal media know that because of the absolute failure of liberalism as enacted by president Obama and the dems in 09 and 10 they face a huge loss in 2012 as the country turns away from their failed policies. She's crazy enough to join the Tea Party. She's just saying that if our representatives weren't constantly feeling the need to jockey for re-election, they might be more willing to compromise. There's nothing in that sentiment that should be such a concern. However, whether the logic bears out in reality would be another question, since the politicians are mostly better at running for office than being in office. She knows that she'll lose due to the trickle-down effect from Obama's poor performance. Is she nuts?.. Congress needs to be flushed, and some sanity restored in that body. Why reward the present group of do-nothings with another 2 years? And this woman is a governor of the state of North Carolina, with a PhD in "education administration". Guess you can get those in cereal boxes now. Didn't think you could make Palin look smart, but way to go "Bev". Really stupid to say such a thing. US politics is screwed up for sure, but let the people change that, not the system. The Democrats WANT to become dictators.........this suggestion PROVES that! They want to bypass the election process.......and that is the mark of a dictatorship, in the making. It has nothing to do, with saving money, as we all know the Dems squander money, like water. Someone suggest this to Obummie. That is the only way he will be in office after the election. She IS afraid to loose her own job so she wants to delay the election process. I think it would do everyone a world of good if Congress were to abolish their "full pay for life" retirement plan and benefits. That way they would focus on legislation that made doing business easier since they would know that in a few years they were going to be back out in the real world trying to make a living. I'll even allow those already covered to continue receiving the current benefits. After all we let them do it to us. I take that back, I think she has a point here. @MTATL67 As well as pelosi, reed, and several other of the long time dems too. Nice to see all the posts are against the comments Gov. Beverly Perdue made. However, she is recommending something that is Treasonous. Removing the right to vote is nothing short of that. When is someone going to charge these people with crimes.